Please contact with Viet Nam Private Car if you want to go from Da Nang airport to Hoi An Silk Village resort safe and most comfortable. You just give us your flight number and your time arrival. Our driver will pick you up at the airport with welcome board write your name, after then transfer to your hotel – Silk village resort. Settle payment to our driver. End of service. You will be received our best service, safe and professional. Don’t worry about price, it always makes you happy. On the way to Silk village resort, you will cross the Dragon Bridge in Da Nang city center. The bridge was designed and built in the shape of the dragon. It’s capable of spraying water and fire, begins at 9 pm on Saturdays, Sundays and on public holidays. You can stop to visit and take some photos. The next stop is Son Tra Peninsula. Son Tra Peninsula is an ideal destination for tourists. Surrounding Son Tra peninsula are Bai But, Bai Rang, Bai Bac, Bai Nom and Silk Village Resort are a famous resort system in Da Nang. Especially, you can see Linh Ung Pagoda – one of three largest pagodas in Da Nang. 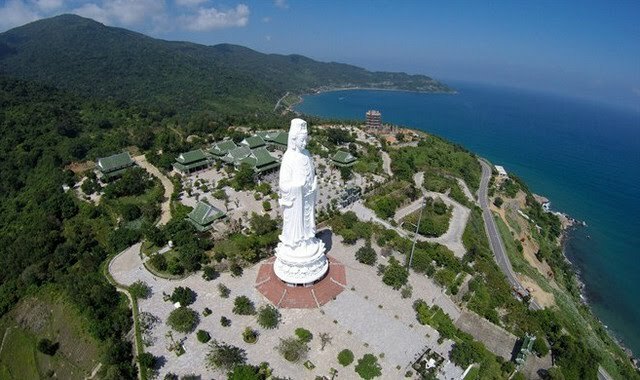 It is so famous for the huge statue of Lady Buddha – 67m high, the highest statue in Vietnam. It’s created a wonderful place where visitors can free their tiredness and sorrows by enjoying the best air. What are you waiting for? Why don’t contact us, we always bring the best service for you? Inclusion: A/C private car, English speaking driver, petrol, road tolls, parking fees.